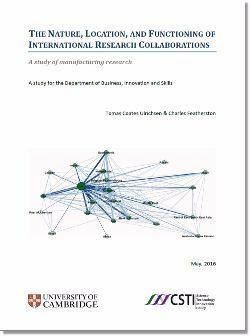 The many and varied benefits from collaborating internationally in research are well established. International research collaborations can have greater leveraged resources, better access to equipment and facilities (both specialised and large-scale) and access to expertise and know-how that may not be available nationally that will enable them to address key challenges of importance and economic value to the UK. It also explored the anticipated effects of international manufacturing research collaborations (IMRCs), crucially distinguishing between their contributions to different types of technologies important for technology development and deployment. It also explore the non-technology contributions made by IMRCs. The study additionally examined what factors may influence the equitable distribution of benefits and costs for all partners, and the likelihood of commercial exploitation of research outputs in the UK. Download here or view in ISSUU below.